How cool is this project? 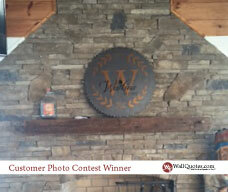 Jamie contacted our designers to create this custom design for his mantel. We were happy to work with Jaime to get the perfect design for his rustic home. The Copper color really pops against the stone of the fireplace! Great choice Jaime! Have an idea in mind that you are not finding online? Our awesome designers are happy to work with you one-on-one to create a one of a kind design for your home, office, church, school, or anywhere! Reach them at info@wallquotes.com.